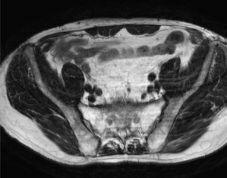 During MRI scans, in imaging terms the part of the body being analysed is scanned step by step and deconstructed into many “wafer-thin optical slices”. At the end, these “slices” are reconstructed to form 3-dimensional images or motion sequences (remodelling): The position of the DynaMesh® visible implant can be visualised and monitored in detail. The 3D internal view supplies useful information. In many indications, the correct positioning of the implant must be checked after a certain time. But a “look inside” involves risks. Conventional mesh implants are invisible in diagnostic radiology. Patients sometimes have to undergo a second-look operation. The unique DynaMesh® visible provides cutting edge technology, which is extremely safe and effective. To put it simply: we mix the PVDF filament with ferromagnetic micropigments using an inhouse procedure. This guarantees optimal incorporation of the pigments. Long-term tests demonstrate that the micropigments are integrated into the PVDF polymer – you could say hermetically sealed. DynaMesh® visible implants can be made visible using magnetic resonance imaging (MRI)  both in standard sequences and in high-resolution, three-dimensional images or even films. As such, radiologists can reliably and accurately determine the position and condition of the implant. Additionally, if required, they can observe how the implant behaves in motion. Because it is so easy and safe to take a „look inside”, DynaMesh® visible opens up new perspectives. Risk-free monitoring of how healing is progressing, optimal monitoring in clinical studies or more rapid development of pioneering implants – together with world-renowned clinical partners. Moreover, DynaMesh® visible is the world’s first technology to visualise textile implants. It was given an award by the German Federal Ministry of Education and Research (BMBF 01EZ 0849). A detailed image of the mesh can be best achieved with GRE sequences where the surrounding structures are relatively homogeneous and displayed as hyperintense areas (Figure 1, left image). The susceptibility artefacts in the mesh should be clearly visible, yet not so strong that they overshadow the surrounding structures. In examinations to date on patients, these were T1-weighted GRE sequences with RF spoiling with a relatively small flip angle, a short repetition time, a short in-phase echo time and little signal averaging (for parameters see Table 1). This sequence enabled a precise assessment of the mesh configuration and clear distinction from postoperative air inclusions on the MRI images. 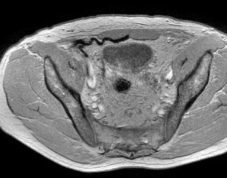 However, it was not possible to make a satisfactory diagnostic assessment of the surrounding anatomy. Another GRE sequence was developed in order to clearly visualise both the ferrous mesh and the surrounding structures (for parameters see Table 1). This sequence without RF spoiling was based on a standard clinical T1-weighted GRE sequence as, for example, used with pulse sequence protocols for abdominal and pelvic diagnostics. As a rule, it was demonstrated that sequences with echo times in opposed-phase (e.g., TE=2.3 ms) are not suitable for delimiting visible mesh implants because of the significant signal drop at fat/water boundaries. In the first patient study, the sequence shown in Table 1 was rated the best for assessing both the mesh and the anatomy, and represents a good compromise between the two sets of requirements; also see Figure 1, middle image. Unlike MR contrast agents, both paramagnetic, gadolinium-based and superparamagnetic (SPIO) contrast agents, the iron particles integrated in the threads only influence the T2* relaxation time and not the T1 and T2 relaxation times . This means that in sequences with refocusing pulses, i.e., spin-echo sequences, the meshes have either very little or no influence on the MRI image. Consequently, the mesh implant can, effectively, be rendered invisible, depending on the sequence type chosen (TSE instead of GRE). Accordingly, visible implants cannot be visualised sufficiently on T2-weighted TSE sequences. For precise visualisation of the anatomical structures, T2-weighted TSE sequences from pelvic examination protocols were used in the patient study; for the sequence parameters see Table 1. As also shown in preliminary studies [3, 5], this allows the surrounding anatomy to be assessed to the necessary degree without interference from the mesh implant; see Figure 1, right image. In a few cases, the distinction between artefact and proton-low/-free tissue or air can be so limited that further, so-called positive-contrast techniques were used (1, 5). The general goal of these measures is the positive, i.e., hyperintense, visualisation of susceptibility artefacts, whilst all the other structures appear hypointense and, as far as possible, without signals. A variety of these techniques are described in the scientific literature, but generally these are techniques which require fairly far-reaching changes to the MR pulse sequences or complex post-processing of the images, and they often react sensitively to changes of any kind. Under suitable conditions (e.g., homogeneous surroundings, simple mesh structure etc. ), the GRE sequences can be accelerated to the extent that dynamic cine and real-time sequences can also be measured and thus the mobility of the mesh implants can be observed. DynaMesh visible mesh implants can be visualised with simple GRE sequences. For a detailed view of the mesh implant, GRE sequences similar to GRE1 are recommended. For detailed images of the anatomy, T2-weighted TSE sequences are ideal. In cases in which the position of the mesh in relation to the anatomical structures is particularly important and complex, additional GRE sequences which clearly visualise both the mesh and anatomy may be advisable. Table 1 provides an overview of the most suitable pulse sequences based on the patient study performed to date. Table 1: Overview of some of the parameters of the pulse sequences used in the first patient examinations. Figure 1: Examples of images of the pulse sequences used in the first patient examinations. GRE1 (left) was most suitable for the detailed delimitation of the mesh (dark line), GRE2 (middle) for assessing the position of the mesh vis-à-vis the surrounding anatomy, and conventional TSE sequences (right) were best at visualising the anatomy, whilst the mesh implant was only inadequately visualised.